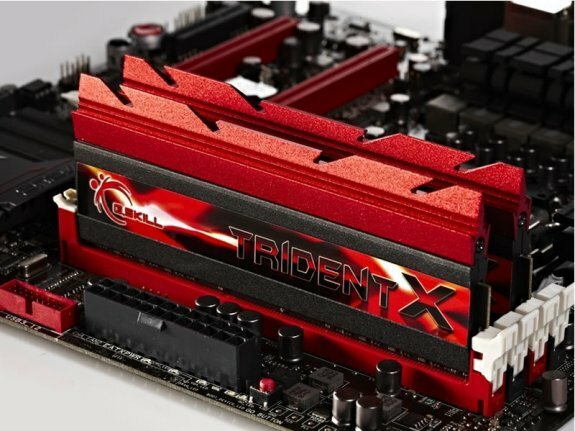 G.Skill reveals Trident X DDR3 modules with a frequency of 2400MHz. These modules have a black PCB and feature a long black metal heatsink with a crown heatsink that can be detached if your processor cooler doesn't allow tall memory modules. Aesthetically, the Trident X series modules don a black+red color scheme, which goes well with the black+red motherboard in the background (in the press-shot). Pictured below are the DDR3-2400 MHz (PC3-19200) modules in dual-channel configuration. The XMP profile runs the module at its 2400 MHz DDR (1200 MHz real) speed, with timings of 10-12-12-31T, and DRAM voltage of 1.65V. The modules will be available in various other speed/timing configurations, and in densities of 4 GB and 8 GB, making up for 8 GB and 16 GB dual-channel kits, for the new "Ivy Bridge" platform; 16 GB and 32 GB quad-channel kits for the Sandy Bridge-E platform. The older Sandy Bridge LGA1155 platform might not be 100% compatible, since it lacks XMP 1.3 support. G.Skill Trident X will be formally announced on May 4.